I have recently taken over the running of the Crafty Cardmakers and Spotlight Challenge blogs and am looking for some new team members to join our happy and talented, bus sadly somewhat depleted band. Crafty Cardmakers is a more generalised blog specialising in, but not exclusive to, card making, and the Spotlight Challenge is more technique based dealing with technique, style or product. Your commitment will be to produce two projects per month and to contribute with ideas for challenges. We take it in turns to host the weekly challenge and it will be your responsibility when it is your week to choose a Top 3. You will also be responsible for commenting on entries, including to the challenges you do not participate in yourself, and to that end you will be assigned a number to comment on. For example all entries ending with 1, 2, etc. 10% of the total entries. If you like the sound of this and think you could give it a go then please create a blog post, in which you can showcase your three favourite projects or those that you think reflect your style the best, and also a new creation for the call along the theme of New Beginnings and then link to it below. The call will run until 2nd October. If for any reason Mr. Linky is missing please add your submission in the comments below. There will be no further challenges posted on either blog until I have a new team up and running and I will put a post up here when we are re-starting. Thanks to all our lovely entrants for the Summer Holiday Memories challenge which was hosted by our former team member Mandy, who has chosen our winner and Top 5. Congratulations Chrissie if you would like to email me at the CCM email address in the sidebar I can sort your prize out for you and please feel free to display our Winner’s Badge on your blog. Congratulations ladies please feel free to add our Top 5 Badge to your blogs. Hope to see you all in the next challenge when we re-launch, hopefully in early October. Don’t forget everyone we are holding a DT call details here and you have just a few days left to enter. I must apologise for the lateness of a couple of these Winner announcements, but as you may have been aware we have had a few issues with poorly team members and some other problems which has meant that winners and top 5s have not been declared since Challenge 47. As soon as I can get things up and running smoothly again I hope to be more ‘on the ball’ with announcing the winners. In the meantime I am delighted to finally announce the following Top 5s and Winners from previous challenges. As I didn’t want anyone to miss out on their prizes, where possible I have dropped the Winners an email to get them to come here and check out this post as by now they may well have forgotten they entered, and if no email address was available on their blog I have left comments. However, in the future we will post the winners and it will be the responsibility of the entrants to check the blog to see if they won. Congratulations everyone. Please Email me with your name, address and email address so I can sort out your prizes and please feel free to add our Winners and Top 5 Badges to your blogs. and current challenge due to finish on 19th September as this will be our last until I can get the team back up to strength. 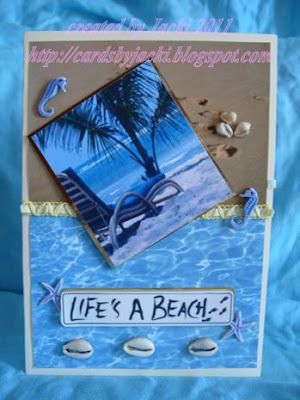 Onto our challenge this fortnight - Mandy has chosen the theme for todays challenge and she would like to see your SUMMER HOLIDAY MEMORIES so that could be a card, layout, ATC or other creation, perhaps of beach scenes, partying whatever you got up to over summer. We are sponsored for this challenge by JOANNA SHEEN who has a huge range of craft goodies including the delightful Faye Whittaker designs which are perfect for this challenge. Do check Joanna's out, if you've not been before you're really missing out and she has free postage worldwide for many of her items! So here's our summer holiday memories to welcome you back! Well I think summer was a few hot days wasn't it? I love visiting the sea and there is nothing nicer than sitting listening to the waves crashing on the rocks and strolling on the beach dipping your toes in the water if it isn't too cold..... My card was made using wordart from TLC Creations, an image from Happileigh Scrappin', a cardstock sticker and ribbon from DCWV and a couple of little seaside theme beads. made this card with one of my favourite stamps at the moment dead cute the background was inked with sir tims distressed inks then children coloured with promarkers. matted up on silver mirri embossed with crafters workshop templates and the vagabond. backing paper anna griffin. top edging EK punch with chipboard flower as the sun. the thanks is die cut in mirri card. For this challenge, I decided to veer away from the standard 'beach/summer holiday' image because I'm really not a beach person! This image reminds me of the coast where I was brought up - stoney rather than sandy - and a view you might see while on a paddle-steamer, and seemed perfect for the challenge. The image is stamped in Versafine ink onto watercolour paper, and then coloured using Aquamarkers. 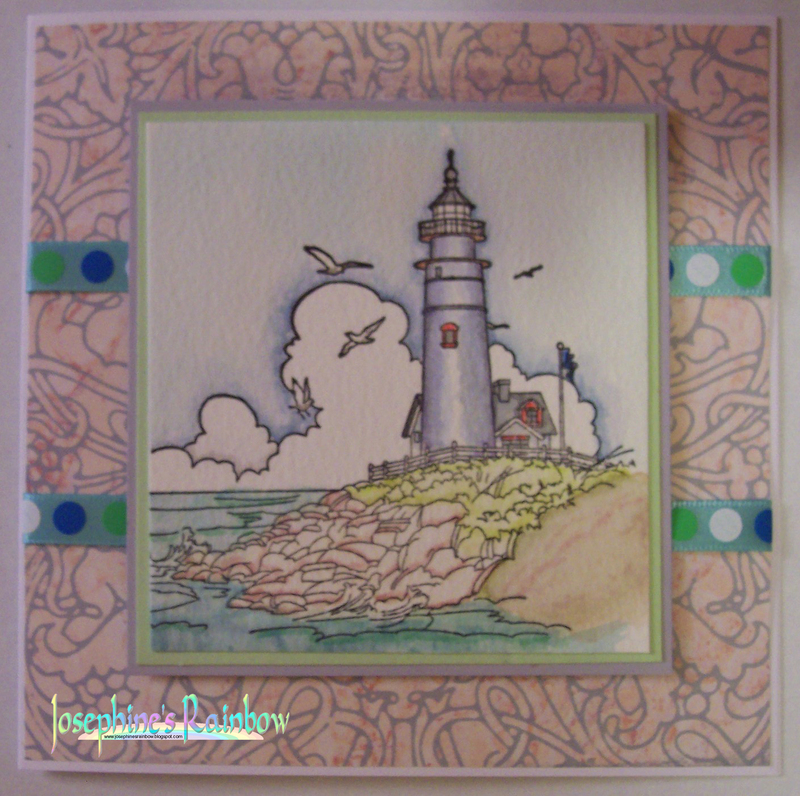 The background is created using distress and adirondack ink pads, applied using a piece of cut n'dry. My card has Edwin and Tilda with their surfboards and the ocean background, coloured with promarkers. The paper is from a digi scrapbook kit, sorry can't remember it's name. The doilies are from my stash as is the ribbon, and the pins, although I added the turquoise beads to the pins. The shells and starfish are real! Found them in a pot in my craft room. No idea where they came from, nor that starfish came that small, but apparently they do. This is me looking glamorous by the sea (I wish, LOL). I live about 35 minutes from the coast so I spend a lot of time there. I've used my Nesties and Tim Holts Retro Circles to make the frame. The sea is a stamp from Stampscapes coloured with Stampin' Up Inks, the bathing beauty is from Artistic Stamper and the sentiment is from Hero Arts. As I was flipping through my stamps I came across this Sugar Nellie stamp called Country Garden. My birthday is smack bang in the middle of summer and this year my daughter went out and picked me a lovely bunch of flowers for my pressie. When I saw this stamp it just reminded me of this and my summer memories :) The paper I have used is from the Bird Song stack from First Edition, i've used my MS garden trellis punch, coloured the image with ProMarkers and the ribbon ,charm and flowers are all from my stash. I've just come back from a great holiday on the Lleyn Peninsula and there is beach after beach after beach all with something different to offer, only went to less than half of them so I've got reason to go back! For this challenge I used one of the fabulous Faye Whittaker stamps from Joanna Sheen coloured with the brand new flexmarkers which are due for release imminently (these really are the dogs doo dahs!) and added some airbrushing with the letrajet around the side. The shells are real, they're actually from a beach in South Africa!